Should I throw my scale away? When I was in college, I knew a beautiful woman. She was beautiful because she was kind and thoughtful and she spent her summers in Haiti helping young pregnant women and new young single Mommies. She also spent many afternoons playing with children in a nearby shelter. She was raucously hilarious, and scary smart in a Bill Gates/Steve Jobs sort of way but with social panache and kindness. She was (is) incredibly adorable and honest and everything that you’d want in a friend, a good listener, a confidante and loyal to the end. But each morning, when I asked her how she was doing, she would say, “I don’t know yet…” and then she would go weigh herself. If the weight was above a certain number, she was doing crappy. She was depressed, she was quiet, she wouldn’t eat, she had a terrible day. If it was below a certain number, she was good. She could like herself and go on with her day. Despite the fact that she was an incredible person, beautiful inside and out and everyone knew it, she still used the scale as a meter to tell her how she should feel about herself. Then she used that number to abuse herself. 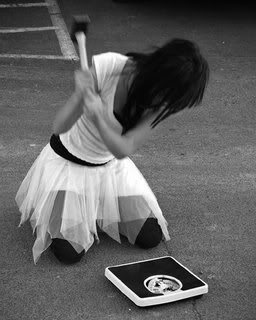 If your scale tells you the way that you are supposed to feel about yourself, you should just throw it out. THE NUMBER ON THE SCALE IS NOT AN INDICATION OF YOUR WORTH. Some people look at the number on a scale and it tells them one thing, it tells them how much they weigh. That’s it. However, it doesn’t work that way with lots of folks. Do you know what I’m talking about? Does this describe you? If the scale is 1, 2, or 5 more pounds than you wanted it to be, do you have a terrible day? Do you hate yourself? Do you wind up crying, bingeing, purging or just feeling plain crummy? If so, then it’s just not worth it. Don’t let the number on the scale tell you how to feel about yourself. Some people can look at the scale and it means nothing other than what it means, that they weigh x number of pounds. If you are not one of those people, then throw out your scale. If your scale tells you whether or not you are going to have a good day, then It has too much power over you and you need to get rid of it. You need to take care of your body to the best of your ability by nurturing it with healthy food and healthy exercise and healthy thoughts and healthy habits. How do you think my friend’s life and her days would have been different if she had not weighed herself every day? She probably would have been able to like herself more without an arbitrary piece of machinery to dictate her feelings for her. She probably would have had more good days. She probably wouldn’t have spent so much time beating herself up because she felt that she didn’t measure up. I’m happy to say that this friend has since recovered from her body image and eating issues, and she’s still a beautiful person inside and out. I asked her if she weighed herself anymore and she told me that the freedom that she feels without a scale in her life is like being out of an abusive relationship. She can really live again and feel like it’s okay for her to make her own decisions about how she is feeling. What do you think? Can you go a week or a month without your scale? 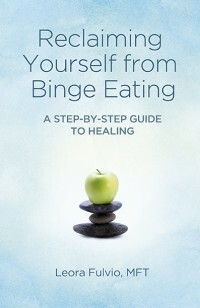 Posted in: binge eating, body image, recovery. Tagged: how often should i weigh myself?, reasons not to weigh yourself, should I stop weighing myself, should i throw my scale away?, throw your scale away, weighing yourself is bad.